I took a walk yesterday in the Ed Piela Wildflower Garden in Stanley Park, Westfield. The fl owers are coming up both native and exotic. 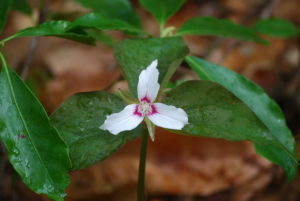 My companions were interested in the different varieties of trilliums you see along the trail. First, we came to the Large-flowered Trillium (Trillium grandiflorum) with its bold white flower and bright yellow center. Many of these are in bloom her right now. You might expect such a dramatic blossom would be hard to misidentify, but there is a white version of the more common Purple Trillium (Trillium erectum) or Wake robin. So look to the petal edge for confirmation. 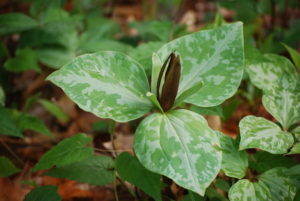 The Large-flowered trillium has an undulating edge while the Wakerobin has a straight edge. There is another white trillium we might find here in Western Massachusetts and one of my companions asked about it on our hike. Of course, this other trillium is a higher elevation species, so I suggested visitin g the AMC property Noble View up in Russell, but suggested that they wait a bit since this other trillium usually blooms later. On the off chance that I was wrong, I took a walk up to Noble View today and hiked the border trail to the left at the main entrance and was surprised to find the Painted Trillium (Trillium undulatum) already in bloom. 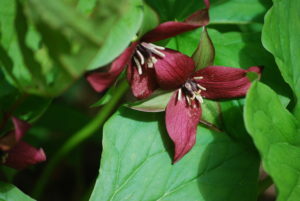 The Painted Trillium has a smaller flower with a splash of purple in its center. Location and this color splash easily separate it from the other two white trilliums. Back at Stanley Park we came across a final species of Trillium, the Dog Trillium (Trillium sessile) o r what we called it in Tennessee, Stinking Benjamin. This unusual trillium holds its petals straight up to form a cone which insects have to navigate to get to the nectar and pollen. The cone acts to keep the sexual parts of the plant warmer and drier for this early spring bloomer. The flower also produces a pretty rancid smell which seems to be attractive to insects, but to us smells a lot like a wet dog, hence the name. 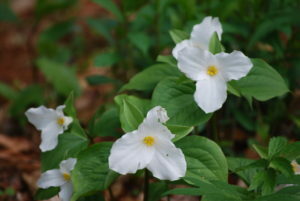 I hope you get a chance to get out and see these trilliums and the other wildflowers this spring. You can find more interesting facts at our Natural history page on wildflowers. Check it out.